Something on a tortilla sounded good. A roll-up of sorts? Yes! I then proceeded to turn that little snack into a big to-do like I normally do and ended up with a plateful of these little bites. These roll-ups are the perfect little bite for the big game. (I'm totally excited about that by the way. Even though my team didn't make it. Again. Ugh.) They're easy to make and definitely a better alternative to the bag of chips. 1. Mix first five ingredients together. 2. Spread about 2 TB cream cheese mixture over each tortilla. 3. Place three slices ham on one half of each tortilla. 4. 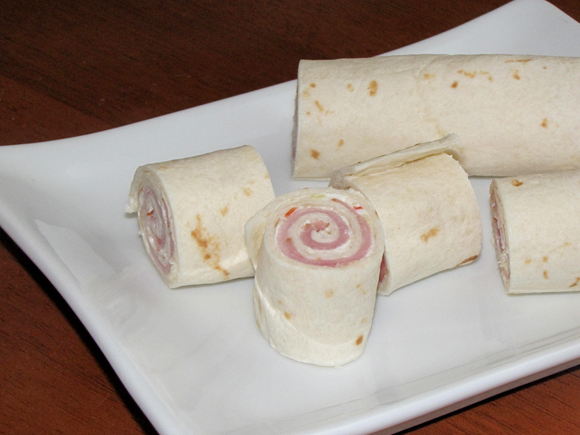 Starting with ham side, roll up the tortillas tightly. 5. Chill for at least 1 hour then slice each into 6 pieces.